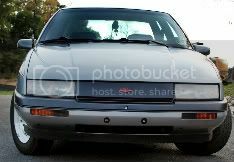 i drive a 93 base 3.1 and i took the cat off and now hooked up a straight pipe.It is really loud, I think maybe because i gotta big fart can on it.please your input. Um, this is a very weird question... You took off the cat and did a straight pipe and put a fart cannon on it and you ask why its loud? I hate to be harsh but why are you modifying cars if you can't figure this one out? No cat means no expansion for the exhaust gases, and also the honey comb center will deaden the sound quite a bit, you removed that and put a ricer muffler on, which 90% of the time is a straight pipe glass packed muffler with a 2" inlet and a 4" coffee can outlet... so you now have almost no muffling system to your exhaust. It would still be loud as hell without any leaks. Ur nuts. If loud is what you want then you got it I guess. Easy guys, it's his car. He can do what he wants to it. Though most of us would not agree with what has been done. Next time please do not post in the archive, it takes a long time to get a reply posted. haha why bother even fart cannin' it? go badass and go completely straight pipe w/ side exit. now thats loud.